Wi-Fi Surveillance Camera Clock | Nerd Much? There are a seemingly endless number of smart cameras for your home, but the majority of them stick out like the red dress in Schindler’s List. Even the best home surveillance cameras aren’t small enough to be inconspicuous. Enter the Wi-Fi Surveillance Camera Clock by Sharper Image, which is exactly what it sounds like. 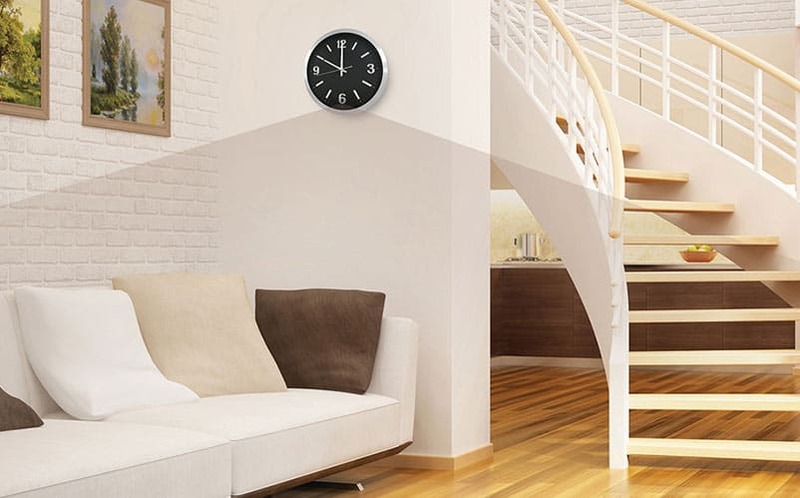 This clock looks like an average clock hanging on your wall, but it has a hidden camera at the number six position that shoots 720 x 480 resolution video at 30 fps. It connects to your Wi-Fi network, which allows you to peak in on your home or business at any time and from anywhere using the free smartphone app. It can also be outfitted with a 32GB SD Card (not included), which allows you to record 57 hours of footage. It can also be set up to record upon any motion detection. So if you’re trying to figure out who keeps putting your stapler in Jello, head over to Sharper Image. For more cool stuff to buy, check in to Nerd Much for daily finds.